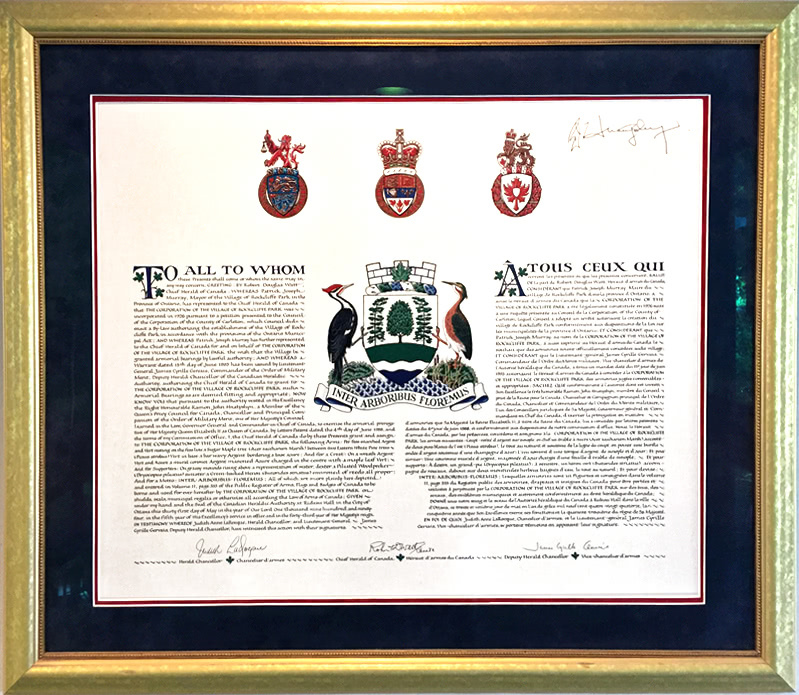 In 1994, the Village was granted a distinctive coat of arms that is registered in the Public Register of Arms, Flags and Badges of Canada. 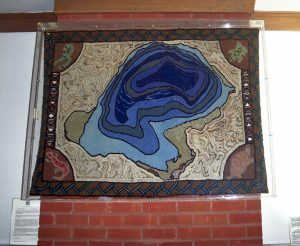 It is displayed in the Springfield Road entrance. 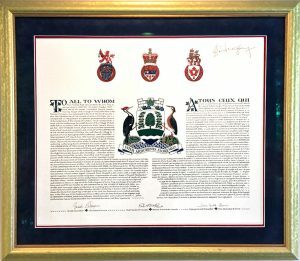 The crest depicts our environs of water and trees and two locally-found birds, the Pileated Woodpecker and the Green-backed Heron. The motto—Inter arboribus floremus—meaning “Amid the trees we flourish,” reflects how our lives are nurtured by our natural environment. 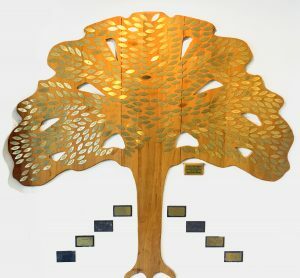 A tree with brass name plates decorates the parking lot entrance of the Community Hall. 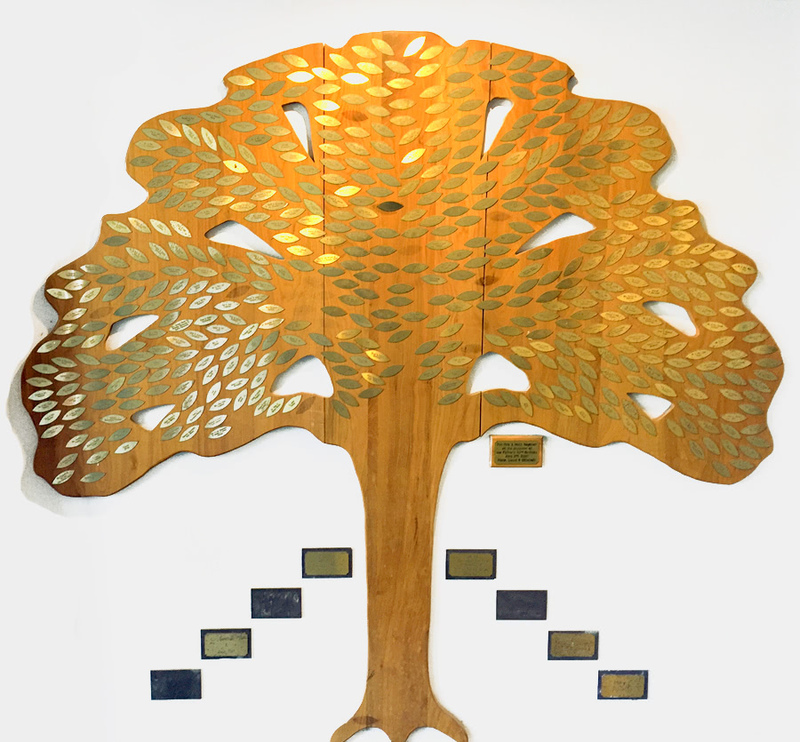 The tree reminds us of the many residents who generously contributed to the building of the Rockcliffe Park Community Hall. 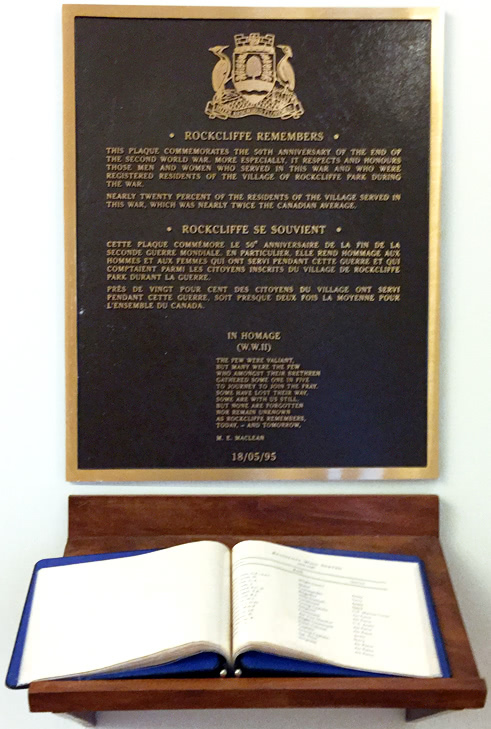 On the 50th anniversary of the end of the War, residents placed a plaque and Honour Roll in the Community Hall to commemorate the men and women from Rockcliffe Park who served in the Second World War. 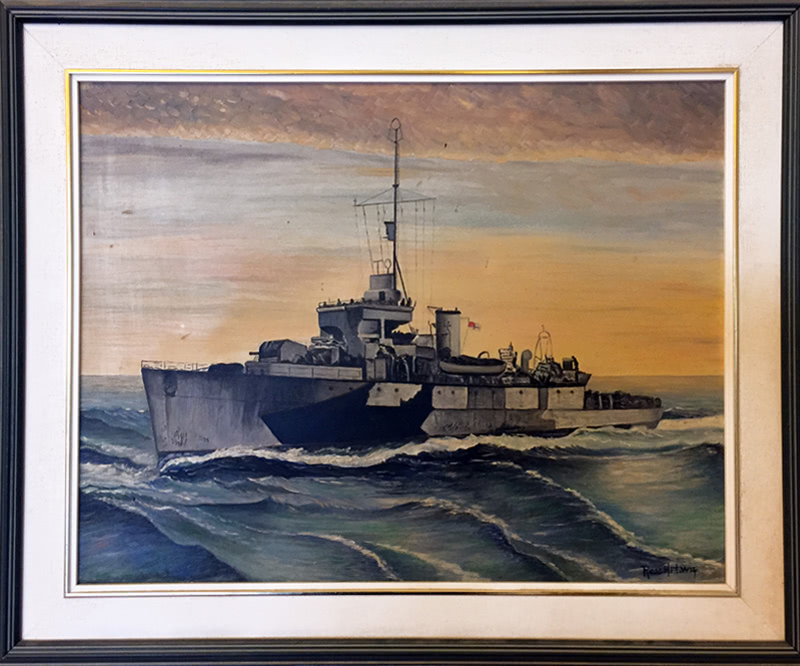 Almost 20 percent of the persons living in the Village at that time served in the War – about twice the national average. The Honour Roll book is permanently on display. 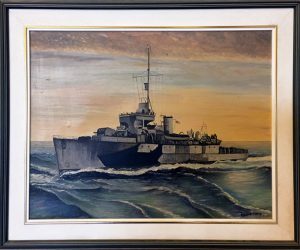 During the Second World War, HMCS Rockcliffe – an Algerine Class minesweeper – saw action on the Atlantic patrol. 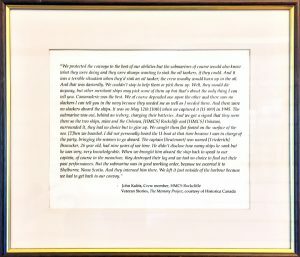 Residents of the Village took part in the national program and adopted their namesake, agreeing to supply “comforts” for the ship’s company. 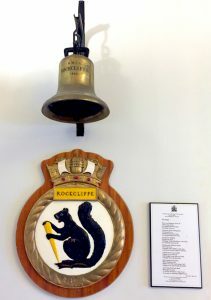 In October 1994, the ship’s brass bell and its crest and a painting of the ship by Ross Helwig and a description of it were presented to the Village for safekeeping. 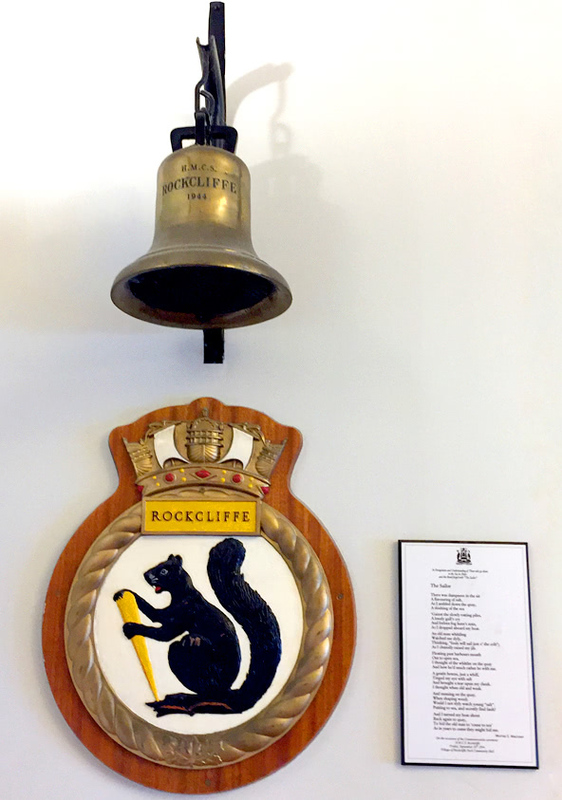 These hang in the northwest corner of the hall. 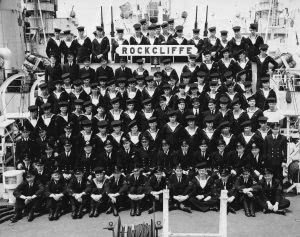 In 2016, the RPRA obtained a photo of the crew of the HMCS Rockcliffe and the story of its capture of a German submarine, which also hang in the hall, courtesy of The Memory Project, Historica Canada. 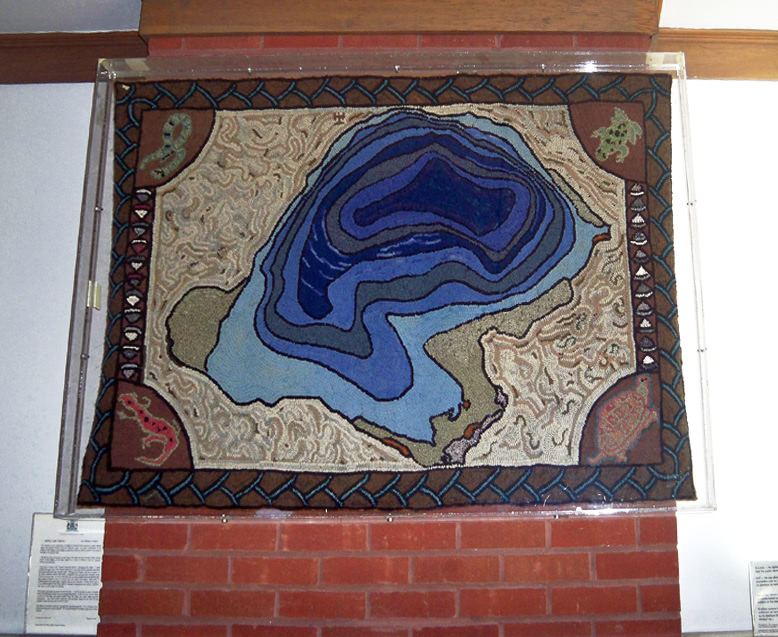 In 2004, Hélène Tolmie, who lived at 597 Mariposa, presented the Residents Association with a tapestry, which she created and which hung in her house for many years. 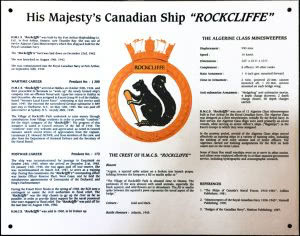 It expressed her delight in having lived, observed, swum, skated, skied, and painted McKay Lake for forty-five years. It is also a tribute to the efforts of villagers who fought so hard from 1963 to 1983 to protect the east side of the lake from shoreline development. Her design depicts the water depth and bottom contours of the lake with a border of vegetation and animals found in and around the lake. Her description of the tapestry sits in a frame below it.